We look at the cash-generating power of the company’s stores and where one might appear if Apple did come to Ireland. THEY ARE THE high temples of all things Apple, with such a pull over the brand’s acolytes the tech giant can command cut-price rents on the strength of its stores as a customer drawcard. But despite the California-based company setting up shop with thousands of workers in Ireland, local fans will have to keep travelling across the border if they want an authentic taste of the Apple Store experience. Since the first official stores opened in 2001, the concept has set the new benchmark in retail – one which has been since copied by everyone from rival tech companies like Microsoft to electric car maker Tesla. 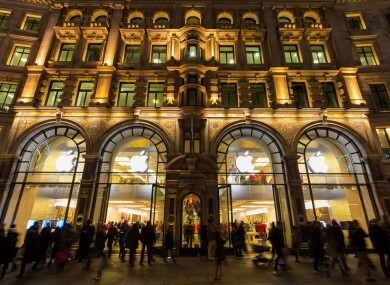 In 2004 Apple launched its first European store at London’s Regent St and it now has over 400 in locations worldwide, including 38 in the UK. Apple’s only official store on the island of Ireland opened at Belfast’s Victoria Square in 2008. In the Republic, the company instead relies on its network of “premium resellers” and other retailers. And that setup doesn’t look like changing any time soon. However the reason why it hasn’t set up south of the border so far is unlikely to be due to a lack of potential profitability – or willing customers. According to Apple’s last annual report, its global network of stores produced some $21.5 billion in sales – about 12% of the total income it received from all channels, including its online store and other resellers. That retail juggernaut has made its outlets the most valuable in the US by size, based on data from analysts RetailSails, worth 50% more in sales per square foot on average than the next-best retailer, iconic jeweller Tiffany & Co.
And to further boost their cash-cow status, Apple Stores are such a drawcard for shopping centres and major retail strips the company can negotiate significant discounts from landlords because of the customers they will pull in. Those concessions have traditionally been reserved for “anchor” tenants like high-end department stores. But the fact the stores, where customers have been known to queue for hours to get served at the “genius bar” of experts, still can’t be found in every run-of-the mill shopping centre in the world is also a big part of their appeal. US author Carmine Gallo, who wrote the book The Apple Experience, told TheJournal.ie the success of the Apple Store concept was all about creating an “exclusive experience” from the combination of premium quality and limited availability. Apple chief executive Tim Cook last year said the company was focussing its expansion efforts on the massive Chinese market – where it plans to triple its stores in two years. Gallo said that was one reason why it was unlikely an outlet would appear in Dublin in the near future, despite the city’s reputation as a technology hub. “They are very good at focussing – they don’t try to be everything to everybody and they don’t try to cover every corner of the world,” he said. One retail expert familiar with Apple’s sales network in Ireland said the most-likely reason for the company’s lack of interest in the Republic was simple: not enough customers to make it worthwhile. “The Belfast store is essentially run from the UK with the same currency, but if they set up here they would need a different vehicle to do that,” they said. There’s also little incentive in installing a flagship store for the Republic as a brand-building exercise as figures show Irish people are already among the most-eager consumers of Apple products. Statcounter has put the share of smartphone users in Ireland with Apple products at 47%, compared to 32% across Europe. That’s despite Irish customers routinely waiting longer than their counterparts in other countries for new-release products, like the Apple Watch - which will first go on sale in only 10 territories including the UK. Darragh Cronin, the head of high street and shopping centre retail at Savills Ireland, said there was no commercial reason why Apple wouldn’t be able to set up in the Republic – although there was a shortage of large sites available in the prime locations of Dublin’s Grafton St or Henry St.
“A store like that is such a draw that people would come to them; they could go into College Green like Abercrombie & Fitch, or even further afield,” he said. Cronin said Apple traditionally wouldn’t pay the same level of rent as other tenants, except in “super-prime” sites like Regent St or the Carrousel du Louvre store in Paris. Even without a discount, rents in Dublin’s prime shopping areas, which during the boom became as expensive as almost any high-end retail strips in the world, have dropped significantly from their peaks in the Celtic Tiger years. David Dalziel, from London-based retail designers Dalziel and Pow, agreed Apple liked trading on an atmosphere of exclusivity and it was possible the company was waiting on the right location for maximum impact. “They don’t take conventional locations any longer – they can create their own footfall so they don’t need to be on Grafton St or Henry St,” he said. For the record, we asked Apple whether they had any plans to set up an official store in the Republic, and on what basis they chose new-store locations, but we didn’t get an answer to those questions. A company spokeswoman instead pointed to the €1.7 billion it was spending for new data centres in Ireland and Denmark. Email “Why there are no Apple Stores in the Republic - and probably won't be for a while”. Feedback on “Why there are no Apple Stores in the Republic - and probably won't be for a while”.